The Saarland charity stamp shown above at the left (Mi. #304, Sc. #B82) was issued on April 28 to raise money for the Red Cross. The design shows a needy mother and child. The 1951 Stamp Day commemorative shown above center (Mi. #305, Sc. #227) was issued on April 29. The design features a mounted mail carrier and a guard circa 1760, with the Old Bridge and the Castle Church of Saarbrücken in the distance. These stamps were also issued in miniature sheets of 10, which are very scarce and quite expensive. The postage stamp shown above right (Mi. #306, Sc. #228) was issued on May 12 to publicize the International Saar Fair held in Saarbrücken. The stamp shows industrial and agricultural symbols, along with the emblem of the fair. The stamp shown above left (Mi. #307, Sc. #229) was issued on June 16 to publicize the Garden and Flower Exhibition held at Mittelbexbach. The central design features the Tower of Mittelbexbach and flowers. In 1955, Mittelbexbach was renamed to Bexbach. The city's 1951 flower garden is still there, and it continues to be one of the principle destinations for visitors. The charity stamp shown above right (Mi. #308, Sc. 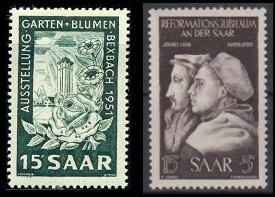 #B83) was issued on October 31 to commemorate the 375th Anniversary of the Protestant Reformation in Saar. Depicted on the stamp are portraits of John Calvin (1509-1564), an influential French theologian and pastor during the Reformation, and Martin Luther (1483-1546), a German monk, Catholic priest, professor of theology, and the principal figure in the Protestant Reformation. 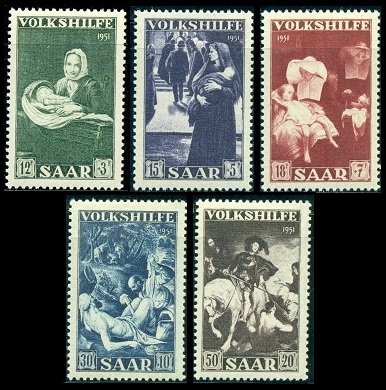 The annual Volkshilfe charity stamp set, shown above (Mi. #309-13, Sc. #B84-88), was issued on November 3, 1951, with the surtax going to public charities. The stamps feature details from classical paintings that reflect the theme of "charity". The designs are as follows: "The Good Mother" by Lepicie (1735-1784), "Before the Theatre" by Kampf (1864-1950), "The Sisters of Charity" by Browne (1829-1901), "The Good Samaritan" by Bassano (1510-1592), and "St. Martin and the Beggar" by Van Dyck (1599-1641).